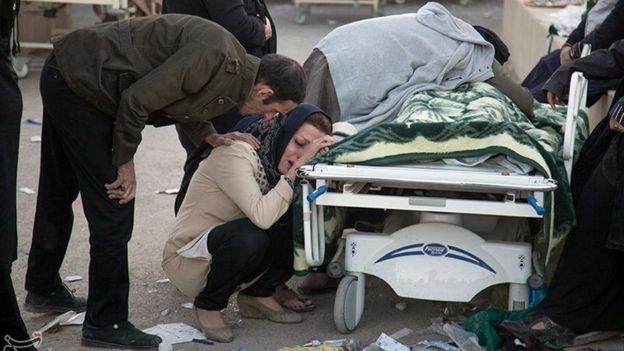 A 7.3-magnitude earthquake has shaken the northern border region between Iran and Iraq, killing at least 343 people and injuring thousands more. The majority of those who died were in Iran’s western Kermanshah province. Nearly 4,000 were said to be injured. Seven people died in Iraq, where people fled into the streets in the capital, Baghdad. “I was sitting with my kids having dinner and suddenly the building was just dancing in the air,” a Baghdad mother-of-three, Majida Ameer, told Reuters news agency. A woman and her baby were pulled alive from rubble in the town, Iranian media said. Many homes in the predominantly Kurdish mountainous area are made of mud bricks. As a result, they are at risk of collapse during a significant earthquake like the one that struck on Sunday. Rescue teams were being hampered by landslides, Mr Koolivand said. About 1.8 million people live within 100km (60 miles) of the epicentre, the UN estimates. “The situation there is very critical,” Kurdish Health Minister Rekawt Hama Rasheed told Reuters. The BBC’s Rami Ruhayem, in the regional capital Irbil, said shaking there had lasted for more than a minute. 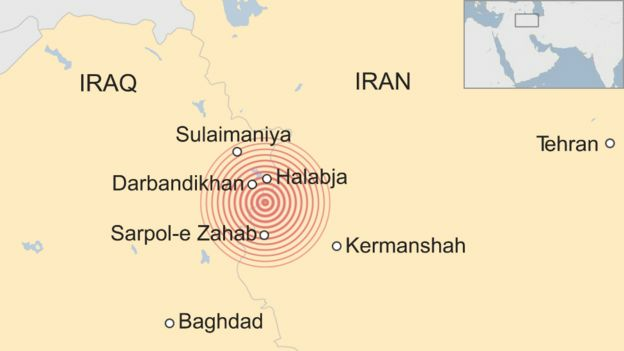 The quake hit at 21:18 local time (18:18 GMT) about 30km southwest of Halabja, near the northeastern border with Iran, the US Geological Survey (USGS) said. It occurred at a relatively shallow depth of 23.2 km, and tremors were felt in Turkey, Israel and Kuwait. 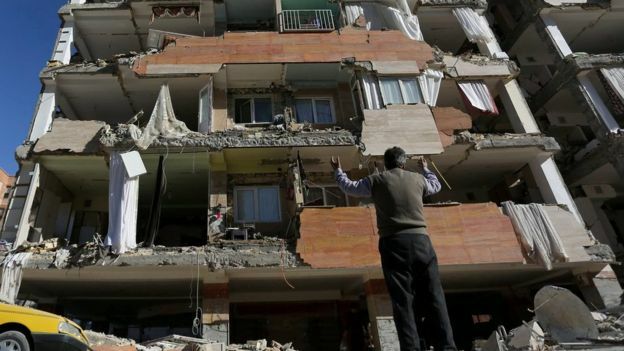 Sunday’s quake is the deadliest to hit Iran since 2012. But it is only the sixth earthquake of magnitude-7.0 or more in 2017 – there were 16 last year and 19 the year before. In general terms, the big driver here is the clash between the Arabia and Eurasia tectonic plates. The former is pushing north by a couple centimetres a year. In the south-east of the country, the Arabia plate is actually pushing under the Eurasia plate, but in the northwest these great slabs rub directly against each other. The Zagros mountains are a result of all this compression. Early reports indicate the quake occurred on a thrust fault. This means the crust on one side of the break in the rocks is moved vertically up and over the other side – which fits exactly with this general picture. Geological agencies now produce immediate bulletins on the likely expected casualties. This modelling work is based on factors such as the size of the quake, population density and what is known about local construction methods. It’s inexact work, but the first bulletins suggested this event could produce many hundreds of deaths and perhaps thousands of injured individuals.